Hugging California’s central coast, Paso Robles, located in northern San Luis Obsipo county, is midway between Los Angeles and San Francisco, about a three-hour drive to either city. Paso (as the locals call it; drop the “Robles”) has a colorful history, which I recount in my previous post here. If you’re a wine geek, you may know this much about the region (and as any vintner here will proudly tell you): Paso Robles has the biggest temperature differential between day and night in the state….Which makes for some delicious wines—see Christopher’s post here. 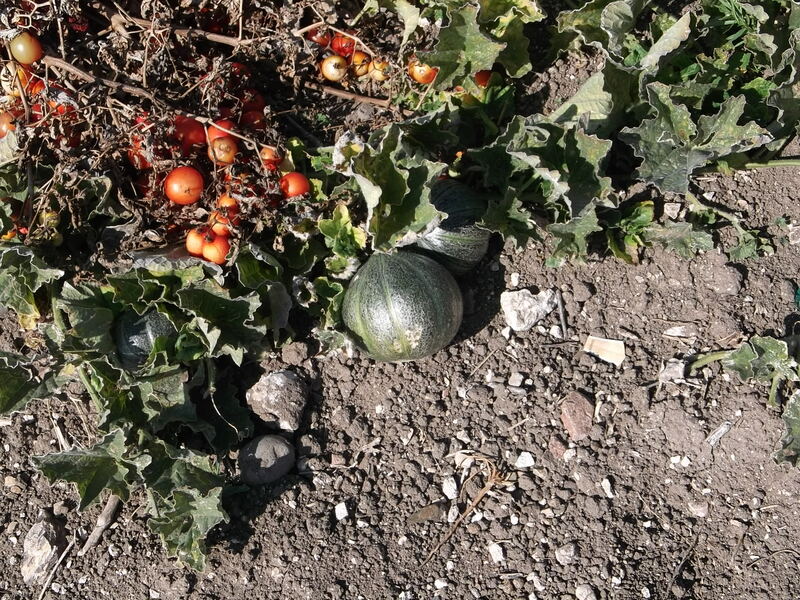 We visited Paso in mid-October during harvest—one of the best times to go. We weren’t quite sure what to expect, but we liked what we found: an unpretentious, kickback town. Friendly denizens. Well-made wines. Hearty comfort food, skewing toward meat and potatoes. An impassioned wine and food community. Hotel Cheval: Comfortable, cozy and close to the action—the place to stay if you like boutique-chic. (And we do). 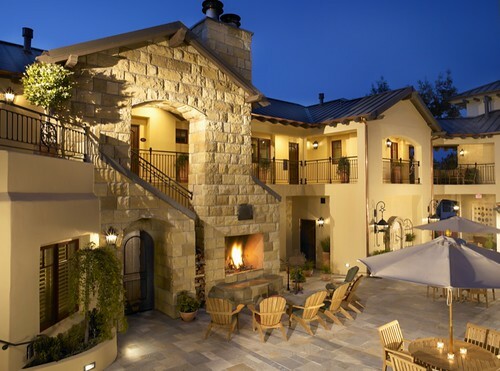 Just off the historic town square, the 16-room Hotel Cheval is centrally located—within easy walking distance of tasting rooms and restaurants. We liked the super comfortable beds, commodious service, and the pretty central courtyard, a great place to hang after a day of wine tasting. 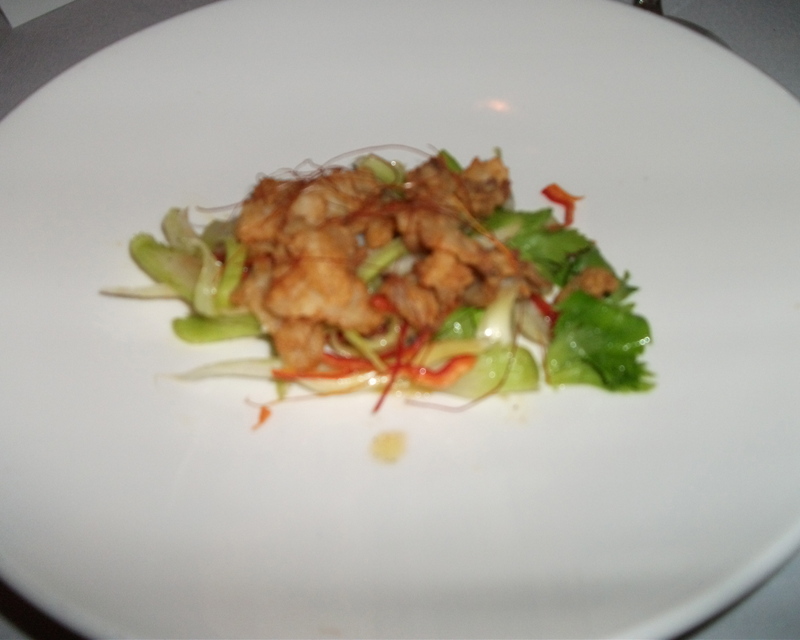 Artisan: The fine dining hotspot in town. Chris Kobayashi helms the open kitchen of this American bistro; brother Michael is general manager. Local and organic ingredients shine, taking a sophisticated, if somewhat precious, turn in dishes, like razor clams with artichokes and celery hearts in a bracing chili vinaigrette (right), or local rabbit with fennel seed sausage and cavatelli. Adelaida: Our mid-morning hilltop wine tasting. For starters, we drank in the stunning view: Adelaida, located west of Paso, sits nearly 2,000 feet above sea level. Talented winemaker Terry Culton (left) makes winsome wines that are elegant and supple, reflecting the limestone terroir of this certified sustainable vineyard. Take Chardonnay… I’m not a fan, but I liked Adelaida’s Chardonny HMR Vineyard (2010), light and crisp, with hints of apple and citrus. Pinot Noir…so hard to do well. 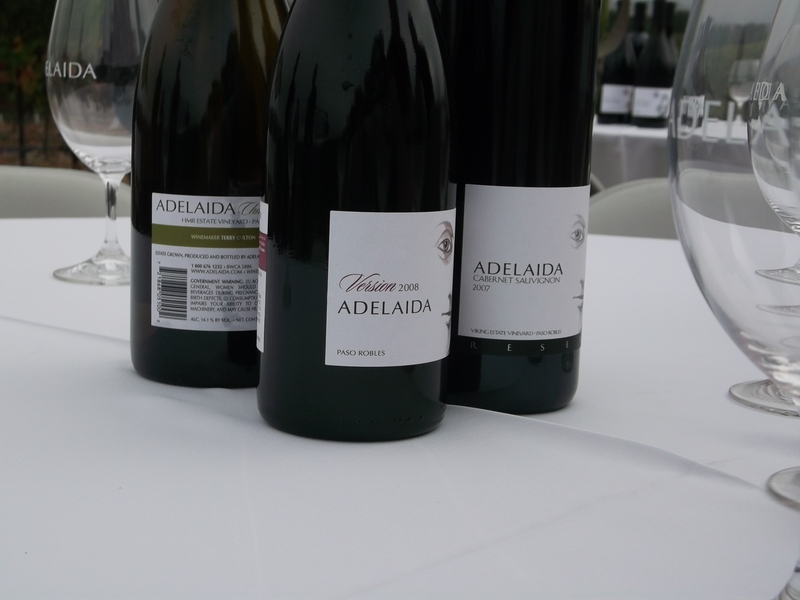 Adelaida’s Pinot Noir HMR Vineyard (2008) was refined, tasting of strawberry preserve. The classic overly oaked, high alcohol “hot” California Cab that I usually eschew? Not here. Adelaida’s Cabernet Sauvignon Viking Estate Vineyard Reserve (2007), vibrant and spicy, showed excellent restraint with the wood, letting the fruit shine through. Cass Vineyard and Winery. Their handmade, hand-rolled tacos. Owner Steve Cass, a former business executive, bought his eponymous vineyard in 1999. Not just a vineyard and tasting room, Cass has also served as a venue for musical events, ranging from a live rock concert, to a solo piano recital during the annual Paderewski Festival in honor of the late virtuoso pianist (and former Paso resident) Ignancy Paderewski. There’s no shortage of wines to taste, with styles ranging from the citrusy Rockin’ One Blanc 2009, chockfull of apple and pear notes, to the Syrah 2008, with its distinct smoke and leather finish. Our memorable gnosh: handmade (and hand-rolled) corn tacos prepared by chef Jacob Lovejoy, who runs the on-site café. “We use seasonal, local produce in our tacos,” says Lovejoy. 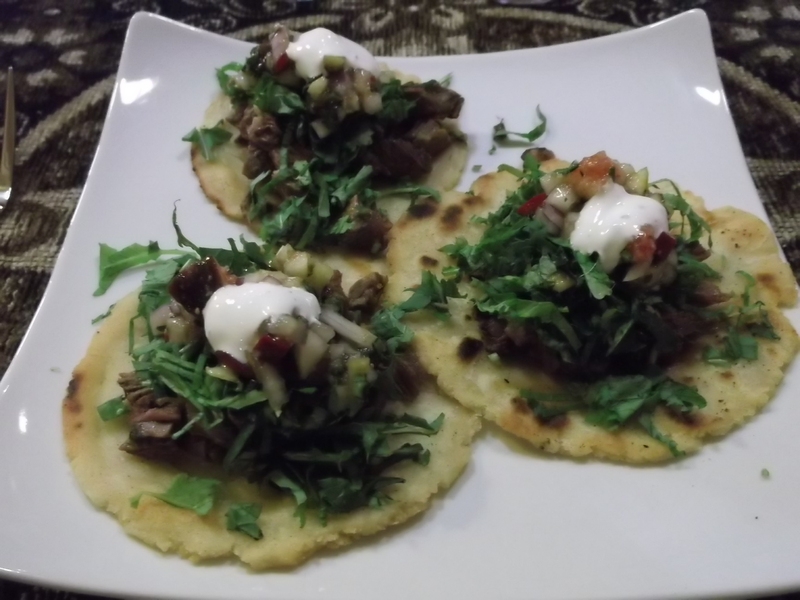 Indeed, these were real beef tacos (the beef is organic, hormone-free and from a Fresno farmer; see above), bursting with bright flavors: cilantro, lime, wild Italian arugula, broccoli rabe, Chinese pears and four types of figs, including Black Jack, Tiger, Brown Turkey, and Peter’s honey. Worth checking out: Cass’ “taco bar”, open Saturdays, during the summer. Thomas Hill Organics. Their organic produce. Their farm-to-table bistro. “What we’re doing is definitely a labor of love,” says Joe Thomas (left), who owns Thomas Hill Organics with his wife Debbie. He was a fine art teacher at Santa Clara University. She worked for an athletic accessory company in Los Angeles. 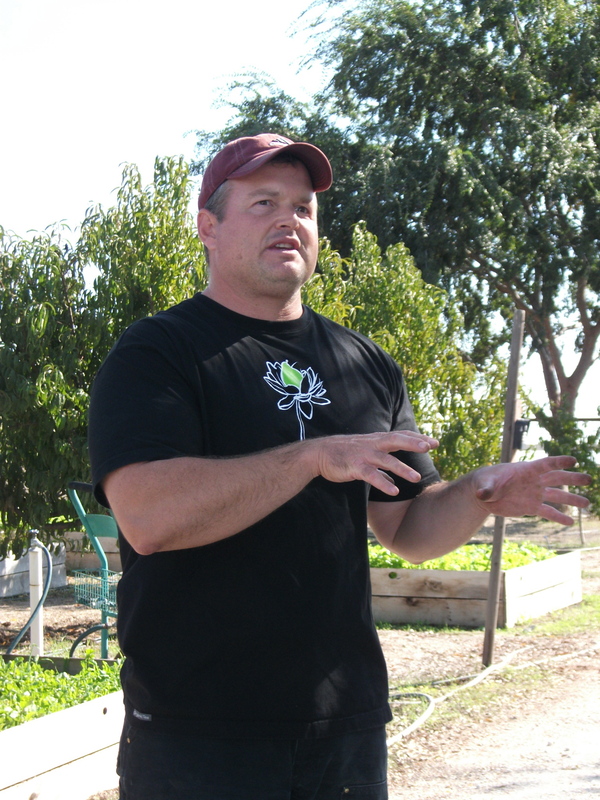 They left Pasadena to pursue a different kind of life in Paso Robles: organic farming. This is my office!” Joe joked, as we toured his fecund property under sunny blue skies. His grandfather—who believed “if you like to eat, then you have to know how to grow food”—had inspired the couple’s lifestyle change. 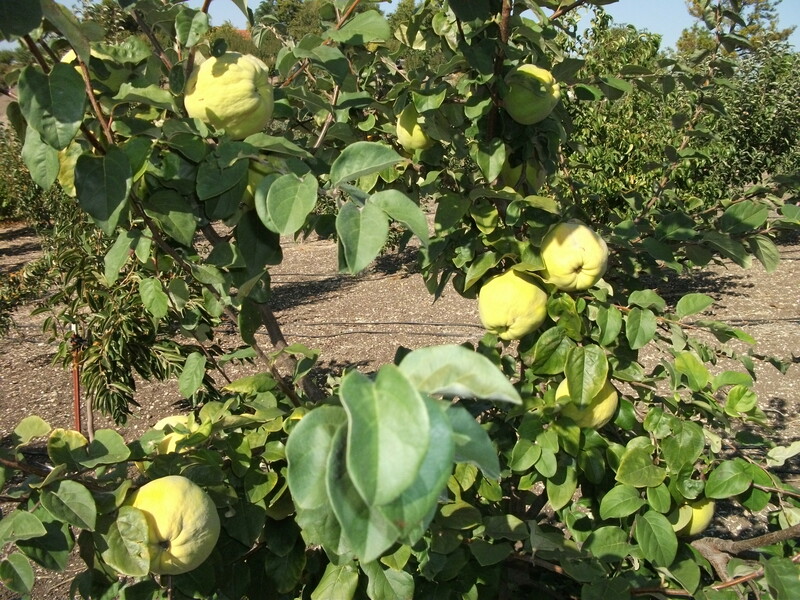 So much flourishes amid this 10-acre expanse: pistachio trees, wild arugula, dandelion greens, chicories, bok choy, nutmeg melons, quince, chilis, tomatoes, tomatillas, pomegranates. We greedily grazed our way through bitter greens, chilis and sun-ripened fruit that we plucked right off the tree. Debbie Thomas runs Thomas Hill Organics Market Bistro and Wine Bar in town, a showcase for their organic produce—and a hot foodie destination (hint: make a reservation!). Chef Julie Simon creates the daily-changing menu. My mixed green salad—mizuna, butter lettuce, arugula, frisee—in a fragrant basil vinaigrette was delicious. 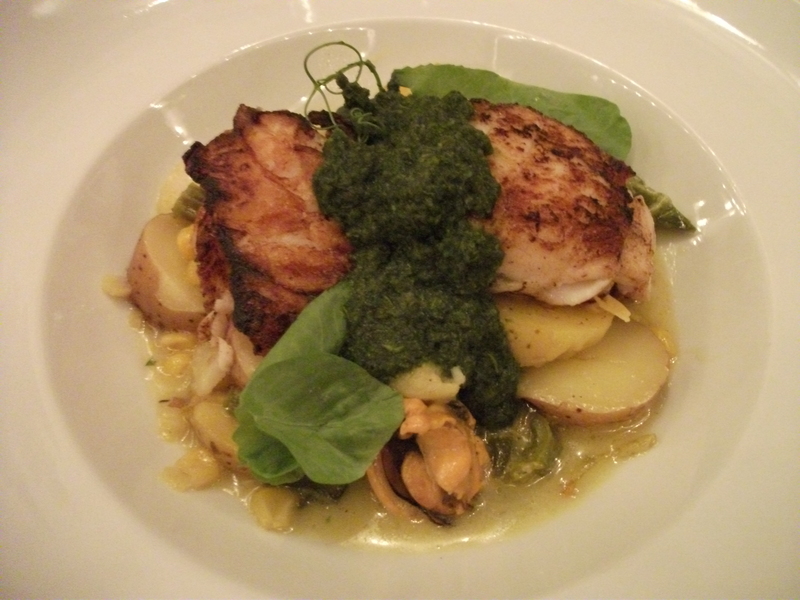 So, too, was the pan-roasted sole with mint chutney, black mussels, fried green peppers in a fenugreek broth (right). The thin-crusted pizzas are popular here. So, I tried the arugula pizza with fennel, braised lamb and feta; it was tasty, though the promised arugula was scant and the crust thicker than I liked. But you have to love an organic-minded eatery with integrity—and Thomas Hill Organics steps up to the plate. Dinner at Gary’s. Gary Eberle, that is. The owner of Eberle Winery is larger than life. 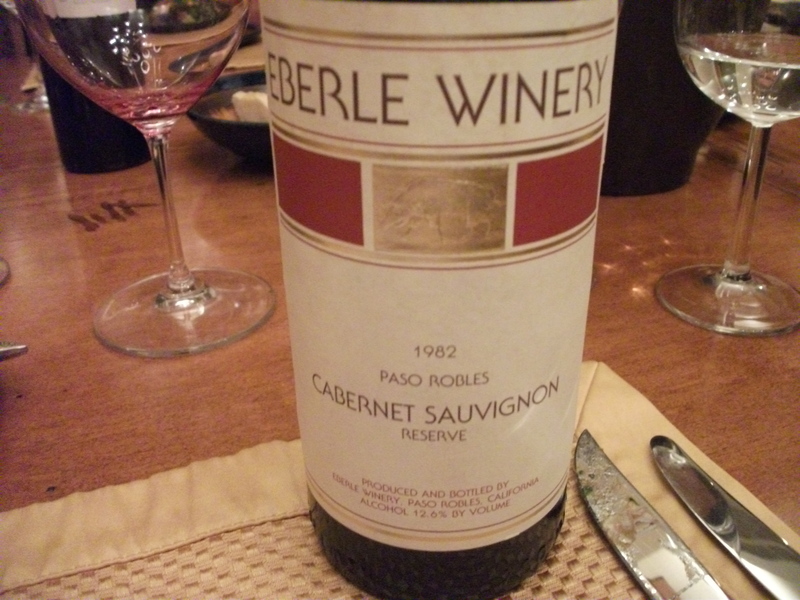 A former Penn State football player (offensive lineman), Eberle was a pioneer in Paso Robles when he began making wine here in 1973. 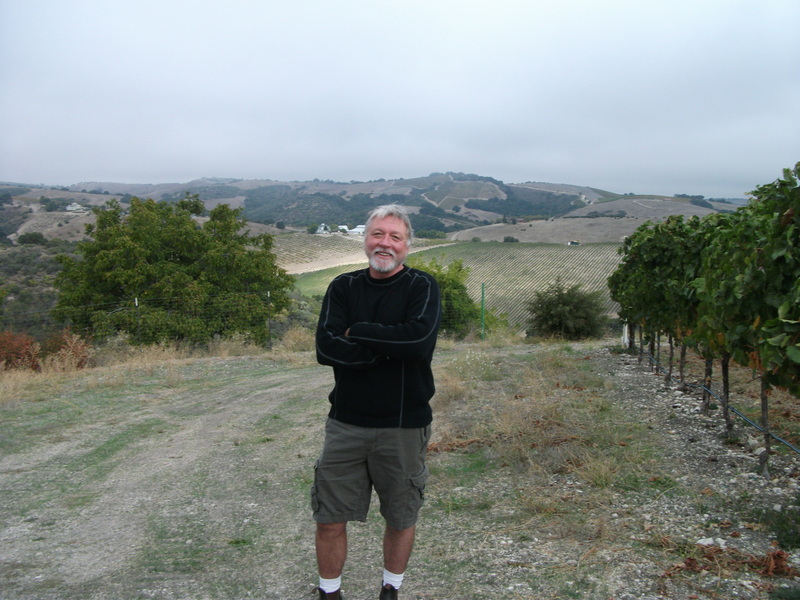 A co-founder of the Paso Robles appellation (in 1980), Eberle is an integral part of the Paso winemaking community, serving on the board of the Paso Wine Country Alliance and the California Wine Institute. Petite to his tall, Marcy Eberle, a former local news anchor, was gregarious and charming. Their home and the grounds are lovely; it’s understandable why Gretchen Rossi (The Real Housewives of Orange County) celebrated her parents’ 40th anniversary celebration here. Gary was a magnanimous host: at dinner, lamb with smoked grapes and beluga lentils was the main event, and Gary served up his 1981 and 1982 Cabernet Sauvignon (which showed how well Paso Cabs can age). 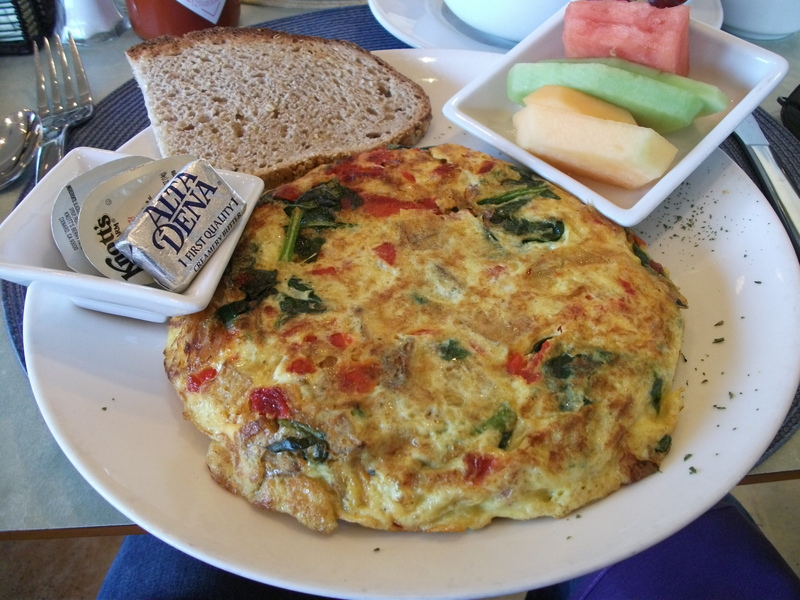 …and it was breakfast. I loved the airy, light-filled space. Purple banquettes and linens add to the cheery vibe. The long counter features a bar and a glass display case filled with in-house baked pastries. If it feels French, that’s because Panolivio is owned by a French couple—Didier and Beatrice Cop—and Beatrice is the chef. Yes, you can get a croquet monsieur here (on white shepherd bread), but we both opted for tortas, an open-faced three-egg omelet. Mine was the house version, with roasted potatoes, spinach, caramelized onions and red peppers; Christopher’s Spanish-style torta also had jalapeno and chorizo. 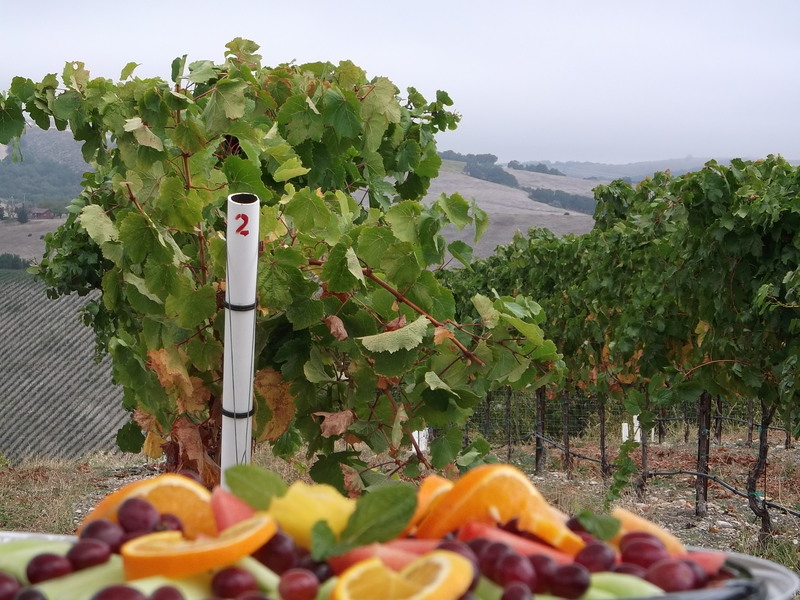 Right now, Paso Robles Wine Country is revving up for their Next Big Event….the Zinfandel Festival: March 16th-18th, 2012. Why go? “Paso Man” says it best: watch here. This entry was posted in Food, Local Food, Restaurants, Travel, Wine, Wine + Food and tagged Adelaida Cellars, Artisan Paso Robles, Cass Winery, Eberle Winery, Hotel Cheval, Panolivio, Paso Robles Zinfandel Festival, Terry Culton, Thomas Hill Organics. Bookmark the permalink.